Ask yourself, what is your vision of the perfect family meal? What does it look like, who is at your table, and what are you eating? For me, it’s having dinner at the dining table, family style, packed with healthy nutritious foods, full of laughter and conversation highlighting the day’s adventures. Often times this is more of a dream than a reality in many households, but our NOAH Care Team offer a few tips to help you make your perfect family meal come true! Plan ahead. You don’t have to be super organized to achieve success. Choose one day of the week for meal planning and spend a few hours creating your menu for the week, grocery shopping (always make a list ahead of time and follow it) and preparing a few meals. This is a great time to cook off your proteins for the week as well as chop up any veggies you may use later in the week. Have your kids help with the whole process. Not only are they learning some great life-lessons, but they will be more interesting in enjoying meals that they helped prepare. Make sit-down meals a priority. Getting the kids to sit at the table for a period of time, all together, can be a challenge. Just as you schedule practice drop-off and pick-up or mtgs. at work, you can start scheduling sit-down dinners. Making this a priority is just as important. If dinner is a no-go, try breakfast? It doesn’t have to be an elaborate meal that requires getting up extra early. A yogurt parfait with granola or whole-wheat toast with egg whites is perfect. 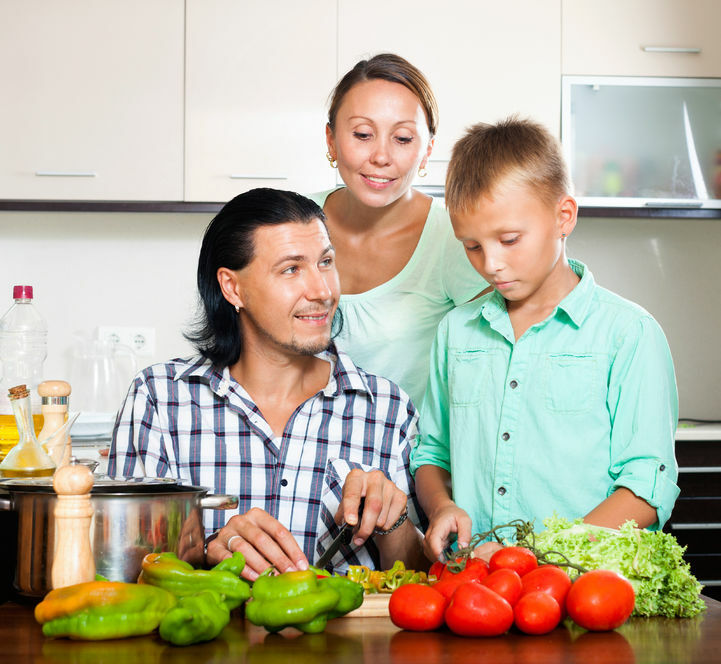 Remember – the goal is to use these occasions as a chance for family bonding and can serve as a teaching moment in creating healthy eating habits. Offer only one option. Now that you have them at the table, they are ready to eat right? Well – most times they are, unless of course, you have picky eaters. Don’t give-in and make different dishes to please everyone. Not only will you never eat yourself, but by the time you are done, you will be exhausted. Instead, make one main dish and offer a few different sides in which your picky eaters can select from. Enlist your children to help prep. The best part about meal-time is that you have an opportunity to teach your kids how to prep foods and learn how to cook. Setting the table or putting left-overs away after dinner not only saves time but it lightens your workload. When children are invested in the process, they’ll be more willing to accept new foods. Yes, even those veggies! Be an example. I’m sure you have heard the saying ‘kids are like a sponge, they soak up everything they see.’ Let’s take advantage of that by leading by example. If your children see you eating something new that they would not otherwise eat or they think is ‘yucky,’ – you eat it and praise the flavors/textures. If they see others enjoying something healthy and nutritious, they are more likely to pick it up and eat it themselves! You have the opportunity to lead your family toward a healthier lifestyle. Following these tips as a family will not only teach your children how to shop for groceries and cook, but how to make healthy food choices, reducing their potential for developing chronic disease such as diabetes or obesity later in life. Our Care Team at NOAH are here to help you create and manage your healthy lifestyle habits. Need help setting or sticking to your goals? Request an appointment or call 480-882-4545 today!